The Curious is a shop run by Suraj Singh on Facebook. He specializes in pencils and pens made in India. You purchase by messaging him, asking him for the price list, then sending him a request with the items. You get a general idea of the cost from the price list. Prices are cheap, but shipping is not. That said his prices are fair and comparable to everything I’ve seen on Amazon, and in some cases better. Depending on how many items you order from him you get your items packaged in bubble wrap and inside a plastic case. 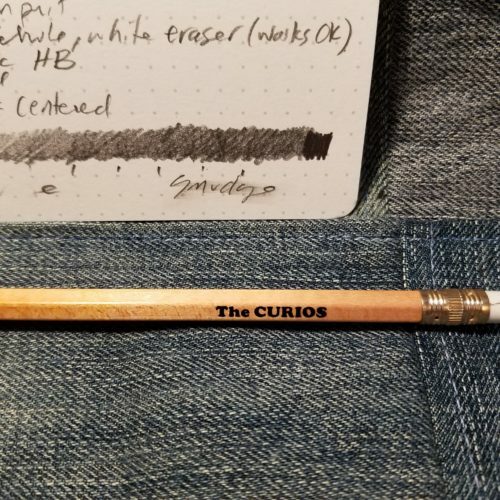 I ordered 50 of “The Curios” pencils and a few others. The case is a nice hard translucent plastic that seals shut with two tiny clasps. The 50 Curios pencils arrive with 5 Apsara Long POint Sharpeners, a decidedly nice cheap plastic sharpener. Cost varies for person to person based off your address. The cost for me to an East Coast US address was $33.50, and that includes shipping and handling, with tracking from India. Suraj was quick to ship and kept me updated with shipping info. 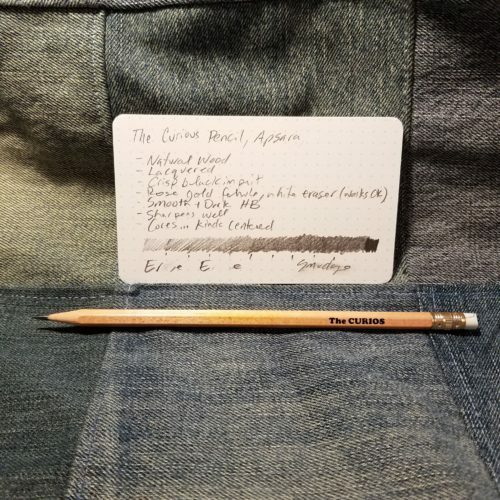 It took awhile for the pencils to get here, a little less than a month. They were well packaged and safe in the plastic box. Inside the box were 50 pencils, as requested. 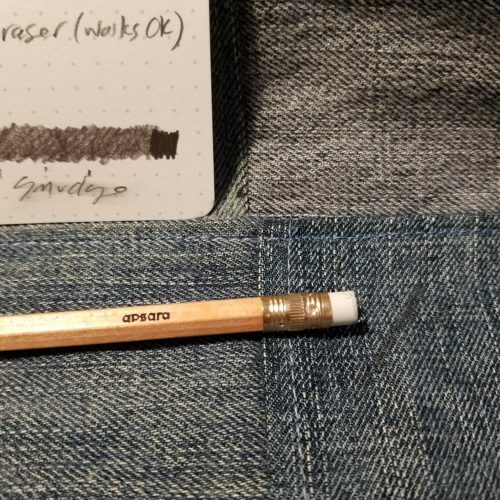 The pencils had cores that were, kinda centered. 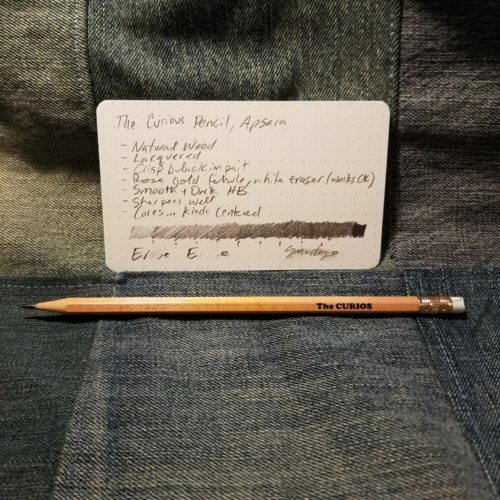 None of the pencils in my package were horribly centered or unsharpenable, but some were pretty off center. The pencils appear to be made of basswood or linden. They are coated in a thin clear lacquer that is glossy and well applied. 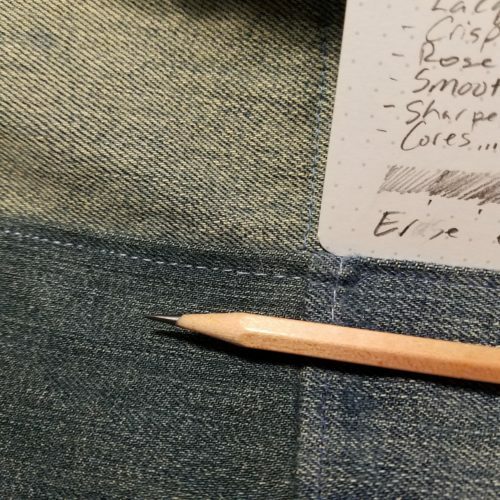 The imprint is well applied on most of my pencils, off-center on a few, but not enough to complain. The ferrule is a rose shade of gold and holds an Apsara white eraser. All the usual complaints about Apsara erasers apply here, they are ok but not exciting. Inside the pencil is smooth and dark for an HB, it is darker and smoother than the Apsara Marbled, but not as soft as the Super Dark or Extra black pencils. They hold a point for a long time and are great for writing. These are a lovely pencil for the price. You get a slightly more even product than purchasing the Apsara Marbles, for a little more money. I’m a fan of lightly varnished naturally colored pencils and Apsara pencils in general, so these tick a lot of boxes for me. I see them as well worth the cost. If I wanted to cut costs, I’d buy a buck of the Marbles on Amazon and have a similar writing experience. Find Suraj on Facebook here. No affiliation here. I purchased these pencils with my own cash money. This entry was posted in Review and tagged apsara, curios, the curios on 20180724 by leslie.